Choose Woolace & Johnson, the most trusted name in plumbing, heating, and air conditioner service for over 90 years. From pipe inspections to emergency plumbing repair, we're the team of local plumbers you can count on for quality service. When your furnace stops working, you need fast and reliable service to get it back up and running quickly. Call Woolace & Johnson for all of your furnace needs. We conduct every service you could need for your air conditioning unit, including fixing refrigerant leaks, replacing broken components, and new unit installation. Whether you need reliable plumbing service, or heating, ventilation, and air conditioning service in Stryker, Bryan, and Napoleon, OH, our team of professionals has you covered. 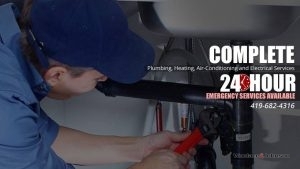 We’re available 24/7 to handle your plumbing emergencies. Our team knows that there damaged plumbing or broken heating and cooling can be a huge strain on you and your family. We strive to handle every issue we encounter in the same professional ability and courteous manner. Call us today at 419-546-0065 for a free quote, or to schedule an appointment with us at your earliest convenience. A plumber can be on the scene for appointments, or emergencies. Our team always shows up when we say we will, and our plumbers always complete the job within the stated amount of time. We perform repairs on broken equipment, but we can replace it and install new plumbing, heating, or air conditioning if you need it. We’ll work with you to ensure we get you the best and fastest possible fix for the most affordable price. Our crew of local plumbers is fully certified and capable of handling any problem you may have. The professionals of Woolace & Johnson have been installing and repairing plumbing for over 85 years. From leaking pipes to low water pressure, we do it all. Our plumber team can handle any clogged pipes or drains. We repair damaged copper piping, or if it’s too far gone, replace it with pvc pipe. It’s our hope that we can provide such quality service that we become your go-to business for any plumbing, heating, or air conditioning repair or installation in the future! 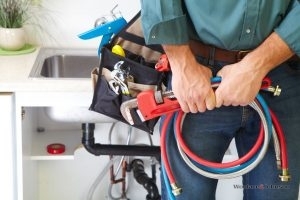 Plumbing Repair Sometimes even minor problems require an expert to repair. Whether your faucet is leaking and you don’t have time to repair it yourself, or heavy rain has caused your sump pump to stop working, we can handle it. Our highly trained team of certified plumbers can handle any sized task. Give us a call and we’ll get to work making the repairs you need done. If you’re looking for quality plumbing services in the Stryker, Bryan, and Napoleon, OH area, contact the professional plumbers of Woolace & Johnson at 419-546-0065 and make an appointment today! Backflow Prevention Sewage in your home is disgusting and dangerous. We can fix the backup and keep it from happening again! Burst Water Pipe Repairs We can repair a broken pipe that is spraying water all over your home and property. Busted, Rusted & Broken Pipe Repair Old pipes need to be fixed from time to time. We can patch anything, and replace what we need to. Drain Cleaning Services If your drains back up, it can cause worse problems than just a slow drain. We can find the source of the clog and remove it! Emergency Plumbing Repairs Burst pipes, sewage backflow, and gas leaks. We’ve got the skills to keep these from damaging your home any further. Gas Line Repairs A gas leak is a huge health hazard. Call our plumbing experts and we’ll find and patch the leak! Hose Bib Replacement If your outdoor faucets get damaged, we can repair or replace them with minimal damage to your home. Kitchen & Bathroom Repairs Our experts can tackle clogs or fixture damage in either of these rooms. Faucet Repair We can fix the slow drips and stuck handles quickly. Garbage Disposal Repair A broken garbage disposal can lead to clogged kitchen plumbing. Shower and Tub Repair A slow draining tub, or faucets barely putting out water, are both annoying problems we can solve. Toilet Repair and Installation It doesn’t matter if it’s clogged or overflowing, we’ve got you covered. Leak Detection & Repair If you suspect you have a leak somewhere in your plumbing, we can find it and plug it! Main Line Plumbing Repair Main line damage can flood your home or yard if not fixed by professionals. Water Line Repair We can find and fix the leaks and clogs to keep your plumbing running smoothly. Water Heater Repair If it’s making strange noises or not heating your water, we can fix it or replace it for you! HVAC If your heat goes out in winter, fast repairs can mean the difference between life and death. It can be the same for an air conditioner going out on a day of record-setting heat. But don’t worry, Woolace & Johnson has you covered! No matter the temperature, if part of your HVAC system goes out, our expert technicians will work quickly and effectively to get your climate control back up and running. 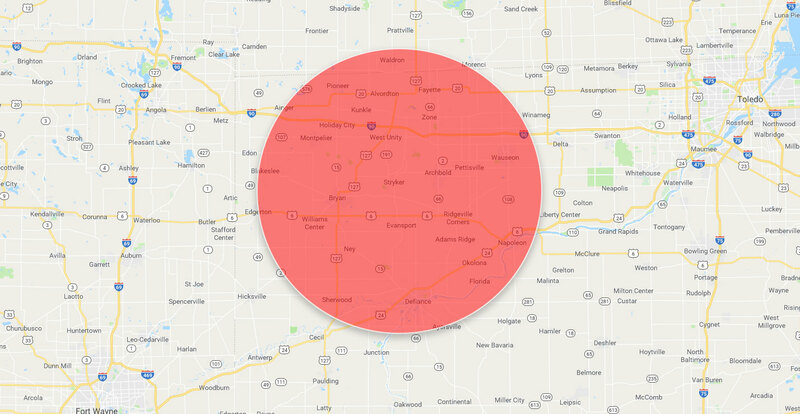 If you’re in Stryker, Bryan, and Napoleon, OH and suspect something may be wrong with your heater or air conditioner, don’t wait to find out. Call the professionals of Woolace & Johnson at 419-546-0065 and we’ll take a look. Air Conditioning Repair When your AC goes out, we can fix whatever part of it is broken! Air Conditioner Replacement and Installation If your AC can’t be repaired, we can work with you to pick out and install the perfect replacement. Central Air Conditioner Repair Central air is supposed to cool off every room in your house. We can make sure it does its job. Emergency Air Conditioner Repair It doesn’t matter if it’s a freon leak or a dead unit, we are available 24 hours a day, seven days a week for emergency repairs. Furnace Repair Our HVAC experts can help you get your heat back on when you really need it. Boiler Repair and Replacement If you use a boiler for central heating, we can diagnose whatever problem it has or replace it if need be. Central Heating Repair Whether it’s furnace or something else, we can fix it. Electric Heat System Repair From electric furnaces to heat pumps, we can repair them all. Gas Furnace Repair and Replacement We can fix whatever is wrong with your gas furnace, from the pilot light to failed components. HVAC Parts Replacement Damaged refrigerant pipes? Compressor coil fried? We can find the busted component and replace it. Air Conditioner Parts Replacement If you air conditioner needs new components, we’re the HVAC experts to call. Heater Parts Replacement Call us if your blower belt breaks or your furnace needs a new motor. We replace it all! Our certified plumber and HVAC experts are ready to help with your inspection, installation, and repair needs. 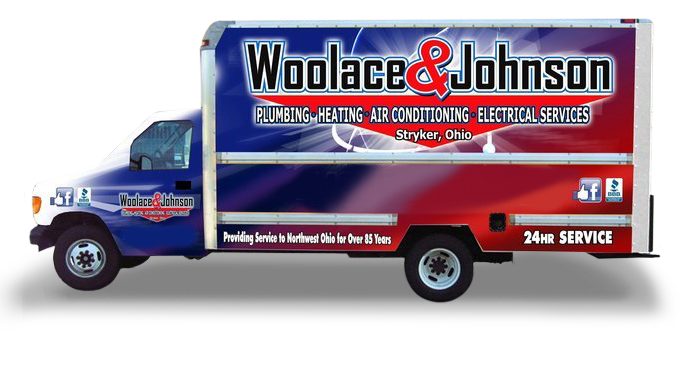 Woolace & Johnson have been the trusted expert plumber repair service of Stryker, Bryan, and Napoleon, OH for over 85 years! We also strive for excellence in heating and air conditioning installation and repair. These are some of the most important pillars of comfort in a home. Nothing can throw a house out of whack like plumbing that doesn’t work. If you’re worried about a potential problem, you can give us a call at 419-546-0065 and we’ll come out and perform an inspection. If our plumber finds a problem, we’ll give you the best, easiest, and cheapest options for repair and replacement, up front. We’ll work with you to ensure that everything is fixed in a professional and timely manner. Our goal is for our plumber team to fix your problem and convince you to come to us for all of your future plumbing service needs from now on. We strive for excellence by showing up when you’re expecting us. We can diagnose the problem with your plumbing, heating, or air conditioning service and get to work on fixing the problem. If you already know what the issue is, we’ll work with you to determine what the best course of action is to get your home back in order. We’ll always give you fair prices, and never try to push unneeded or unnecessary upgrades or installations. We’ll work hard to ensure your plumbing, heating, and air conditioning units work for as long as they’re able to. We’ll only suggest new units or repiping if you absolutely need it. If you’re in Stryker, Bryan, and Napoleon, OH and need plumbing, heating, or air conditioning services, contact the team of Woolace & Johnson at 419-546-0065. Updated on February 20, 2019 at 5:03 pm by Woolace and Johnson. Same-day service is available along with 24-hour emergency service. We gladly give FREE estimates and offer service contracts as well.